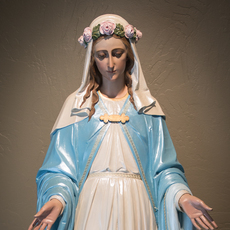 Daily Rosary for Mary — The month of May The daily rosary will be prayed every day Monday—Friday at 2pm throughout the month of May. Members of the Rosary Altar Society will lead this prayer. All are welcome to join the Rosary Altar Society in the Blessed Sacrament Chapel, Monday, Wednesday and Thursday and in the main church Tuesday and Friday at 2pm to recite the rosary. Vigilia de Jueves Santo Acompañando a Jesus en el calabozo y Dulce compañia a la Virgen una noche de Oración De: 11:30pm a 4:00am Favor de llegar antes de las 11:30pm las puertas cerraran a las 11:30pm. Holy Thursday Vigil Accompanying Jesus in the dungeon and sweet company to the Virgin one night of Prayer From: 11:30 p.m. to 4:00 p.m. Please arrive before 11:30 p.m. the doors will close at 11:30 p.m.